My little I-guy turned 9 over the weekend. 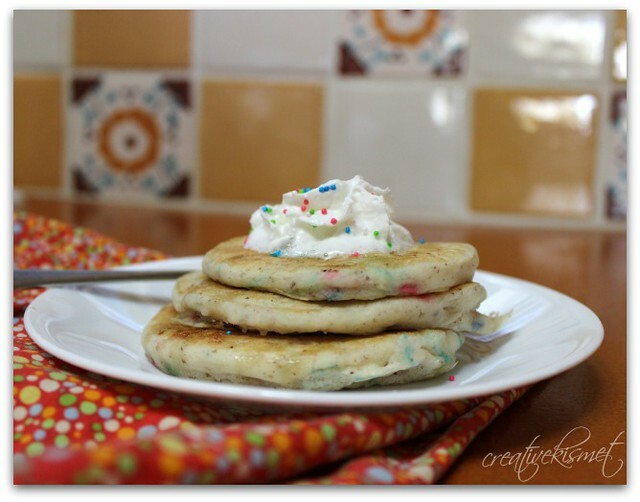 We always try to make the day extra special so we started it off with some yummy sprinkle pancakes. I used our favorite vegan pancake recipe with a tablespoon of sprinkles, topped with a bit of soywhip. Certainly not a typical breakfast around here, which made the birthday boy just totally blown away. 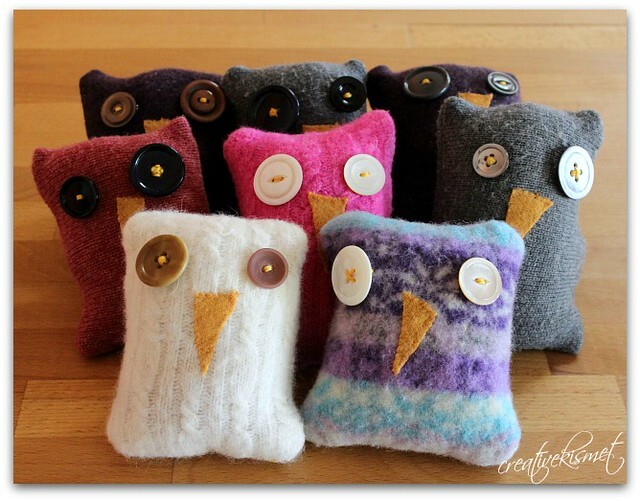 Some beanie bag owls were (frantically) made the night before as party favors–made from recycled sweaters. Delicious cupcakes were made exactly as requested, “Chocolate cupcakes with vanilla creme filling and strawberry frosting”. The boy is a genius because these were amazing. 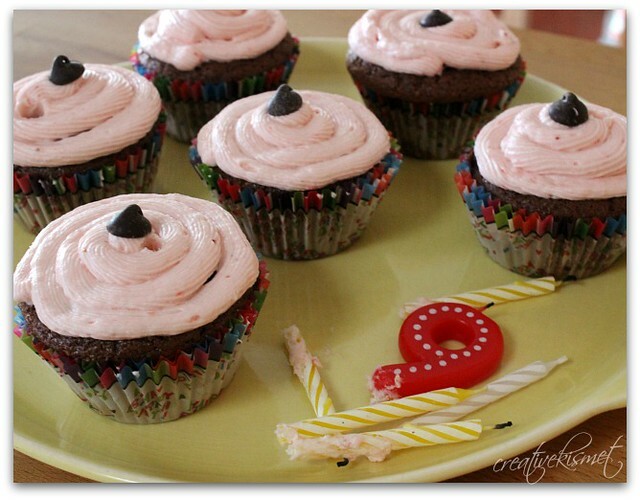 I used Chloe’s recipe and modified the frosting by adding 3 pureed strawberries. It surprisingly had the perfect strawberry flavoring. So good! Of course the day wasn’t complete without his three best friends, some laser tag, video games, yo-yo tricks and puppy play. He went to bed that night tired, full and VERY happy. 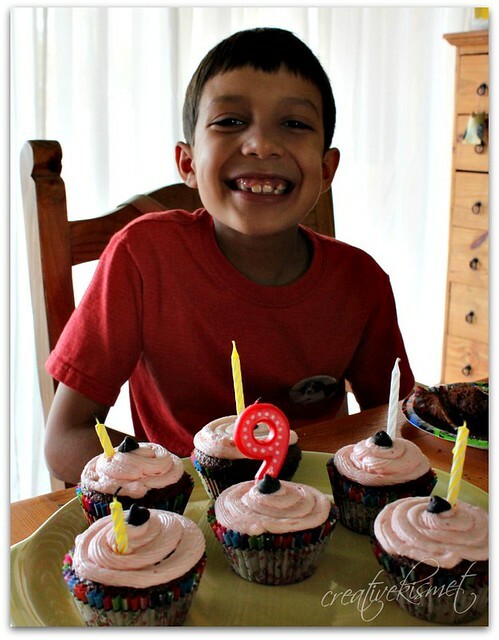 This entry was posted in Family Life, Food, recipes, Fun kid stuff. Bookmark the permalink. how special! 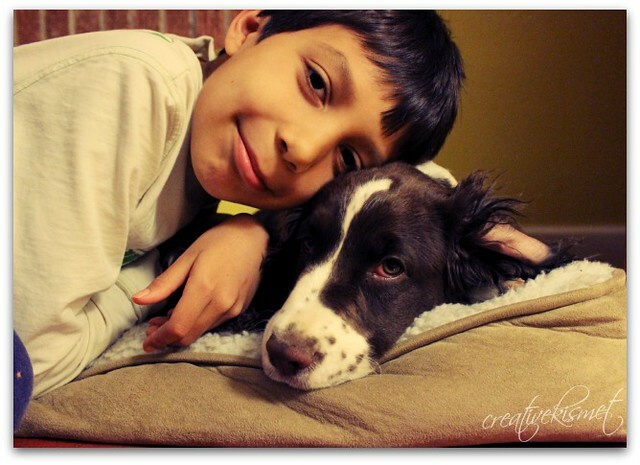 what a gorgeous photo of him and his puppy! 9 is amazing…Happy Birthday to I-guy! the cupcakes look delicious! Those owls are absolutely darling!!! Happy 9th Birthday to I-guy! I have a 10 yr old I-guy (Ian) who is also allergic to dairy and when I make chocolate cupcakes, instead of using a traditional icing, I often top them with a large Belgian dark chocolate wafer in the last minute of baking so that it melts over the top. If I want to dress them up, you can add sprinkles immediately after you take them out of the oven when the chocolate is still soft, but you have to act fast. If you timed it right, the chocolate hasn’t lost it’s temper and still has a pleasant snap when you bite into it. If it is in the oven too long, the chocolate remains soft and gooey. Mmm, I think I have to go bake now!